The Green Bay Packers Lower Sideline is the informal name for all of the seats on both sideline of field level at Lambeau Field. The Lambeau Field seating chart shows the Packers Lower Sideline stretching the length of both sidelines from one corner of the field to the other. Green Bay Packers Lower Sideline seats are spread among 18 different sections. Nine sections are on the home sideline: Packers Section 112, Packers Section 114, Packers Section 116, Packers Section 118, Packers Section 120, Packers Section 122, Packers Section 124, Packers Section 126, and Packers Section 128. Nine sections are on the visitor’s sideline: Packers Section 111, Packers Section 113, Packers Section 115, Packers Section 117, Packers Section 119, Packers Section 121, Packers Section 123, Packers Section 125, and Packers Section 127. Every seat within the Lower Sideline provides a fantastic view of the field from the closest sections anywhere in the stadium. While many fans prefer the front rows to get as close as possible to the action, being too close to the field actually creates obstructed views as fans cannot see over the players and personnel on the sideline. 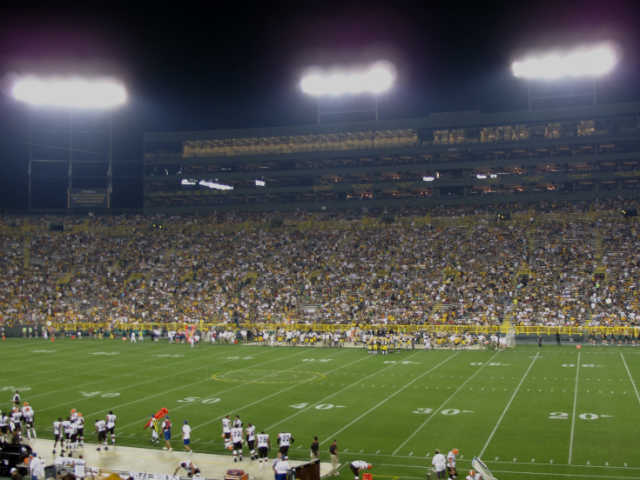 The sections closest to the 50-yard line, 119 and 120, are the best non-luxury seating areas at Lambeau Field. Packers Lower Sideline tickets are sold to long-time season ticket holders who buy full packages of ten games. With a waiting list stretching into multiple decades, it is quite difficult for non-season ticket holders to get Lower Sideline tickets. Fans looking for individual game Lower Sideline tickets should consider ticket websites and independent Packers ticket sellers. Prices vary based on demand for specific games. Popular regular season games will cost far above face value while preseason games against poor competition may sell for a discount.